The eye in the Holy Bible is mentioned under many meanings, there is the physical human eye, the spiritual eye that sees things unseen by the biological eye, there’s also animals’, birds’, insects’, fishes’, and other creatures eyes in different shapes and colors. We also hear about the brain’s eye, as if the brain sees and has an eye, and we also hear in the Holy Bible about the Cherubim who are full of eyes, referring to knowledge. Then, the bible reveals to us the eyes of God, with his unlimited wisdom, leading us – according to our limited language- to understand what the Bible refers to:” For who has known the mind of the Lord? Or who has become His counselor? ( Romans 11:34). We read about God’s eyes in Revelation that they are like flames of fire” These things says the Son of God, who has eyes like a flame of fire, and His feet like fine brass” ( Revelation 2:18). God’s flames lights darkness, for everything is revealed and is seen by Whom our lives is In His hands, and if we realize that, we would feel ashamed thinking of sin which is the true darkness, for how could I lie, steal, desire evil or trespass God’s commandments knowing that His flaming eyes surrounds me?… This fire flame burns and cleans leading to holiness, there we realize why the Holy Spirit was called the Fiery spirit, I’m in desperate need of the Son’s fiery flame to work in me, cleansing my soul so that His glory is manifested in me. Also, God’s eyes in the Holy Bible refers to God’s supreme care for His children” Keep me as the apple of Your eye; Hide me under the shadow of Your wings” ( Psalm 17:8). Also for guidance” I will instruct you and teach you in the way you should go; I will guide you with My eye” ( psalm 32:8). Let us know my brethren, that God’s eyes are on those who call Him, asking for His help and mercy” Behold, the eye of the Lord is on those who fear Him, On those who hope in His mercy, To deliver their soul from death, And to keep them alive in famine” ( Psalm 33:18-19). Also the faithful person does not lie and his ways are not twisted, has a humble heart in front of God and other people, the Lord’s eyes are upon him” The one who has a haughty look and a proud heart, Him I will not endure. My eyes shall be on the faithful of the land, That they may dwell with me; He who walks in a perfect way, He shall serve me. He who works deceit shall not dwell within my house; He who tells lies shall not continue in my presence” ( Psalm 101:5,6,7). The Lord’s eyes are absolutely pure, the Bible says even” the heavens are not pure in His sight” ( Job 15:15), so what happens to me, the weak sinful human?! ” “If the righteous one is scarcely saved, Where will the ungodly and the sinner appear?” ( 1 Peter 4:18), wouldn’t that lead us to complete humble submission under God’s hands that would lift us? For no matter what good we do, we will remain deficient and impure in front of His eyes. Therefore, the church teaches us by Spirit in the third watch of the midnight prayers in the Agpeya” with a compassionate eye, O Lord, look at my weakness, for shortly my life will end, and in my deeds I shall have no salvation. Therefore, I beseech, O Lord, with a merciful eye look at my weakness, my humility, my poverty and my sojourn, and save me”. The human eye might be evil because of many reasons, the most important being the heart of that person, and that is what The Lord has referred to when He said” For from within, out of the heart of men, proceed evil thoughts, adulteries, fornications, murders, thefts, covetousness, wickedness, deceit, lewdness, an evil eye, blasphemy, pride, foolishness” (Mark 7:21,22). And the evil brings a lot of trouble to it’s bearer, we hear The Lord in the sermon on the mount saying” But if your eye is bad, your whole body will be full of darkness. If therefore the light that is in you is darkness, how great is that darkness! (Matthew 6:23), the evil eye turns a person’s heart into an arrogant, unclean heart, condemning others. Here, The Lord asks, warning us” And why do you look at the speck in your brother’s eye, but do not consider the plank in your own eye? Or how can you say to your brother, ‘Let me remove the speck from your eye’; and look, a plank is in your own eye? Hypocrite! First remove the plank from your own eye, and then you will see clearly to remove the speck from your brother’s eye” (Matthew 7:3-5). And in Proverbs we read” The eye that mocks his father, And scorns obedience to his mother, The ravens of the valley will pick it out, And the young eagles will eat it” (Proverbs 30:17). The human eye can look at everything, in the book of Ecclesiastes we read” The eye is not satisfied with seeing” ( Ecclesiastes 1:8), also Solomon tells us” Whatever my eyes desired I did not keep from them. I did not withhold my heart from any pleasure, For my heart rejoiced in all my labor; And this was my reward from all my labor. Then I looked on all the works that my hands had done And on the labor in which I had toiled; And indeed all was vanity and grasping for the wind. There was no profit under the sun” (Ecclesiastes 2:10,11). And it’s not hidden form us that anything that we see in this world will perish” For all that is in the world—the lust of the flesh, the lust of the eyes, and the pride of life—is not of the Father but is of the world. And the world is passing away, and the lust of it; but he who does the will of God abides forever” ( 1 John 2:16,17). The Lord has asked us to deal with utmost cruelty with our eyes if they lead us to sin” If your right eye causes you to sin, pluck it out and cast it from you; for it is more profitable for you that one of your members perish, than for your whole body to be cast into hell” ( Matthew 5:29). We have to understand the deep and not the literal meaning of this verse, for what benefit if a person plucks his eyes out and his heart and mind are still sinning? Also, the evil eye shows hatred, it’s blinded with detestation and envy, the Holy Bible says” But he who hates his brother is in darkness and walks in darkness, and does not know where he is going, because the darkness has blinded his eyes” ( 1 John 2:11), it also shows a crooked path” A worthless person, a wicked man, Walks with a perverse mouth; He winks with his eyes, He shuffles his feet, He points with his fingers; Perversity is in his heart, He devises evil continually, He sows discord” ( Proverb 6:12-14). On the other hand, a righteous eye; to which heaven’s secrets are revealed, we hear David talking about it saying” Open my eyes, that I may see Wondrous things from Your law” (Psalms 119:18), it’s the eye that’s always looking up towards God, asking confidently for mercy” Unto You I lift up my eyes, O You who dwell in the heavens” (Psalm 123:1). ” The eyes of all look expectantly to You” (Psalm 145:15), ” For Your lovingkindness is before my eyes, And I have walked in Your truth” ( Psalm 26:3), knowing assuredly that he will be saved from all Satan’s temptations” My eyes are ever toward the Lord, For He shall pluck my feet out of the net” (Psalm 25:15). 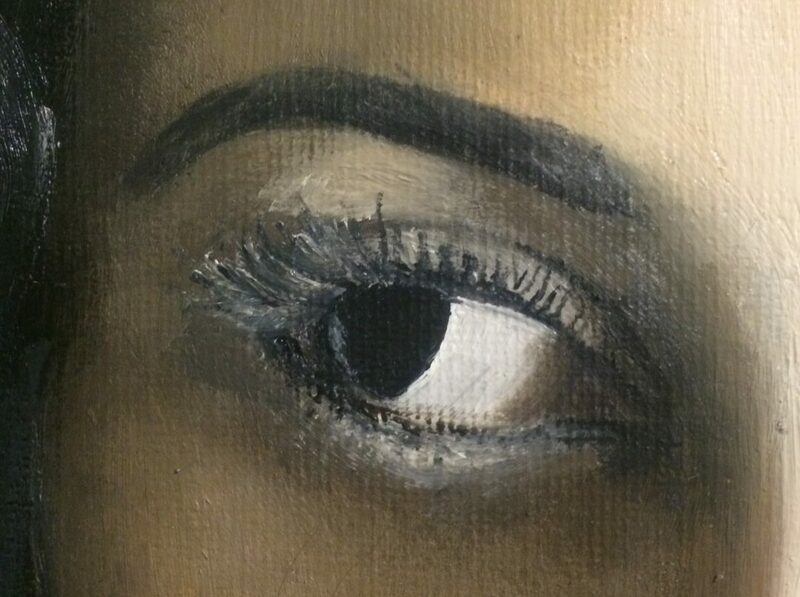 How beautiful is the simple eye, behind which lies a pure mind, the eye that has been circumcised by grace, on which the crucified Jesus Christ has been portrayed” before whose eyes Jesus Christ was clearly portrayed among you as crucified? (Galatians 3:1). The Lord also teaches us that” The lamp of the body is the eye. If therefore your eye is good, your whole body will be full of light” ( Matthew 6:22), Job talks to God saying” I have heard of You by the hearing of the ear, But now my eye sees You” (Job 42:5). The great Thing that gives light to our eyes is the Word of God proclaimed to us in the Bible” The statutes of the Lord are right, rejoicing the heart; The commandment of the Lord is pure, enlightening the eyes” (Psalm 19:8), ” My son, give me your heart, And let your eyes observe my ways” (Proverbs 23:26). Would you please O lord grant us a simple, pure and modest eye, that asks for your mercy and enlightens through your commandments, that we may become qualified to see your glory and become worthy to be called to serve in your vineyard. Didn’t You say to your disciples” Do you not say, ‘There are still four months and then comes the harvest’? Behold, I say to you, lift up your eyes and look at the fields, for they are already white for harvest! (John 4:35), “The harvest truly is great, but the laborers are few; therefore pray the Lord of the harvest to send out laborers into His harvest” (Luke 10:2).